The Nuclear Decommissioning Authority (NDA) took over ownership of 17 of the UK’s earliest nuclear sites in 2005. The sites are all at different stages of decommissioning. Although shortages in skills are forecast over the 100-year plus mission, some stages of decommissioning require smaller workforce numbers on a site. At Wylfa, electricity generation ended in December 2015 and the site moved into its defuelling phase. This meant that a number of roles were no longer needed. Aware of the potential for the job losses to impact the community around Wylfa, Site Licence Company Magnox Ltd investigated how the skills, where possible, could be retained. Experience shows that it isn’t always possible to assume people can be transferred across disciplines and geography. Nevertheless, this year Magnox Ltd successfully moved 14 employees from Wylfa to Trawsfynydd, approximately 70 miles away. This is an excellent achievement. Each employee has between 7 to 20 years in the nuclear industry or at Wylfa. I think most people can appreciate how difficult it is to leave a familiar role and environment. So it’s understandable that some employees responded to the Trawsfynydd transfer proposal with “No way!”. However, even those who were most reluctant found that after a little encouragement and trial time at Trawsfynydd, the friendly welcome and support was beyond their expectations. Many reported that they settled in to their new role quickly, even finding the work the most interesting they’d ever done. They look forward to the challenges ahead. I hope this story sends a message of optimism to our existing workforce and potential new recruits. It confirms that there are opportunities to transfer or upskill/retrain, even mid-career. We are working on programmes to develop skills in partnership with nuclear owners and operators, UK government, regulators, trade unions and external bodies. 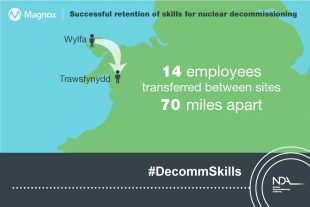 So nuclear decommissioning can provide a career for life, and employees can consider transferring skills at any point. As mentioned earlier, we will face shortages in skills for nuclear decommissioning, so, where we can, we need to retain the skills we have now, and attract new people. It can be a fascinating career.